So after feasting on made-from-scratch baked goods, I was feeling a little bloated. I was going for a second cup of coffee and diving for the coffee dispenser before the afternoon lectures. The Monday I came back, I went straight for the grocery store and loaded up on sweet potatoes, eggs, almond butter and lots of fruits and vegetables. I wanted change, and I wanted it NOW. I sailed through the first couple excited days. Nicoise salad, sweet potato hash with fried eggs, it really didn’t even feel like a “diet”! I even made it past the next few days, when your body is supposedly depleted its carb stores and not yet adapted to metabolizing stored fat for energy. One of my sons had a birthday, and we went out to my favorite bakery and brought home a box of cupcakes. And I didn’t eat any. The second week, it started to get old. I snuck a peek at the scale — which the Whole 30 book explicitly warns you not to do . One pound down, after depriving myself of rice, bread, ice cream and cupcakes all week. I started to get really tired of eggs. During yoga class, I had to sit down because I was feeling weak and light-headed. That morning, I had only a smoothie for breakfast, which isn’t really enough for that level of exertion. My friend Pat from Pickles and Tea came to San Francisco, and I helped her with her cooking class and didn’t taste the fruits of our labor. Then we went out to dinner in Chinatown, and I ate winter melon and scallop soup and sautéed pea shoots, while she ate salted fish fried rice. Not bad, but not exactly living life to its fullest, either. I had some doubts about the program — its dogmatic adherence to a limited menu, the admonitions to stay away from smoothies and so-called “paleo” treats which rely on elaborate substitutions to recreate regular desserts, the cultish following it inspires. 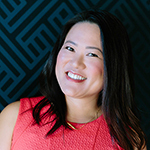 I went to a party that involved a barbecue dinner, and my chicken came heavy on salt and slathered with sweet sauce, which I scraped off — but still ingested enough to have a headache that night and feel a little off the next day. If I went purely by the book, I should have gone back to Day 1, but I wanted to be realistic. What kind of effects could I see if I eliminated foods to the extent I could while still having some social life? Did I really need to cut out soy, something my ancestors have eaten for generations and has never caused me any problems? I went out to Korean barbecue a couple days ago, trying to stick with the unmarinated beef, but I also snuck a few pieces of bulgogi and spicy pork. By the way, I felt fine. I still have some skepticism about those parts of the plan. What I also realized is that I do pretty well under the structure of rules and the challenge of intentional ascetism — for a limited period of time. Remember when I did my no-shopping challenge? Besides the feeling of never feeling that round-belly, curl up on the couch sense of fullness, I had to admit, my energy levels were stable throughout the day, my gut felt great, and my pants were getting looser. I was also surprised at how often found myself wandering around the house during times of stress or writer’s block, looking for something I was allowed to eat. About halfway through the 30 days, I got it. Eat a lot less sugar, fewer processed carbs, take it easy on the bread and dairy. Today is Day 30, the final day of this grand experiment. This morning, I stepped on the scale. Five pounds down. But I’m not that excited. This ain’t my first rodeo. Diet, I mean. I’ve never been in a rodeo. I know how hard it is to lose a few pounds and how easy it is to gain them back once you revert to your usual habits. But more importantly, my blood pressure is noticeably lower and my rings easily slide on and off. And I have a more realistic idea of how much I’ve relied on the convenience of takeout, the comfort of cookies, and the ease of processed food. We don’t even eat that much processed food, but I think we rely too much on bread-y things for easy breakfasts and sandwiches and such. But when I exercise, I think I’ll need more complex carbs for energy — at least I need to strategically eat them when they can fuel my activities rather than converting to fat. So today is not just the Last Day of the Whole 30, it’s the beginning of adjusting my diet and my habits. My goal is to carefully test out the foods I’ve eliminated over the past month. I’m particularly worried about wheat and dairy. I already know large amounts of cheese and steamed milk are not my friends. I also want my bones to not shrink any faster than they need to. Wheat, on the other hand, is totally my BFF. Or I like to think of it as such. Maybe more of a frenemy. And sugar. Sweet sugar. It’s probably way more of a problem for me than I even realize right now. 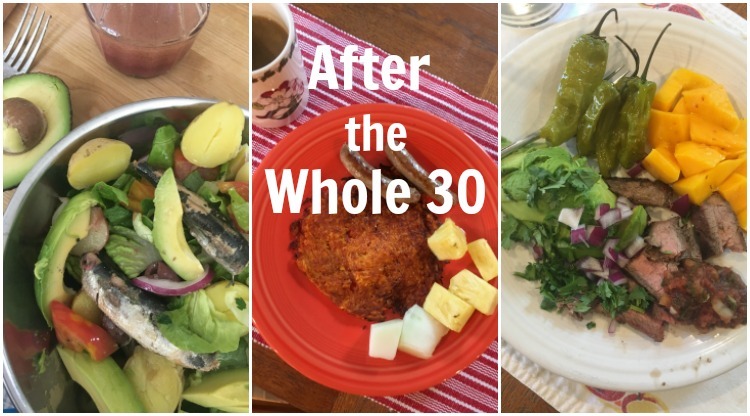 Have you tried the Whole 30 diet? Let’s talk about your experiences in the comments.